I converted from day hiking and car camping to backpacking in spring 2013. My backpacking trips are mostly weekend excursions in Southern California. 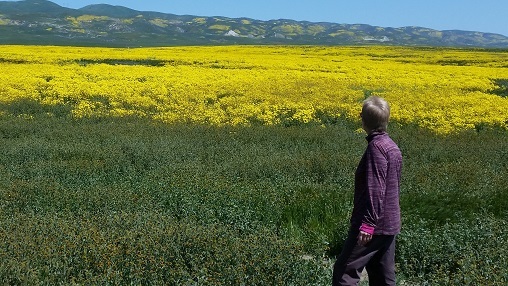 The locations range from Joshua Tree National Park desert areas in the cooler months to mountainous Southern California National Forest elevations in the summer months. I try to backpack one or two weekends a month. I always hike with a group and I like the gear talk when in camp. While I am looking for ways to lighten my pack, I am not an ultra-lighter: I like sleeping in a tent with a sleeping bag on a comfortable pad. In January 2017, I added snowshoeing to my winter activities. Four Color Choices: Black/White. Blue Smoke Heather. Grey Heather. Brandy Heather (shown below). Five Sizes: XS (2), S (4-6), M (8-10), L (12-14), XL (16-18). The ExOfficio Women's Terma 1/4 Zip arrived inside a clear plastic bag. 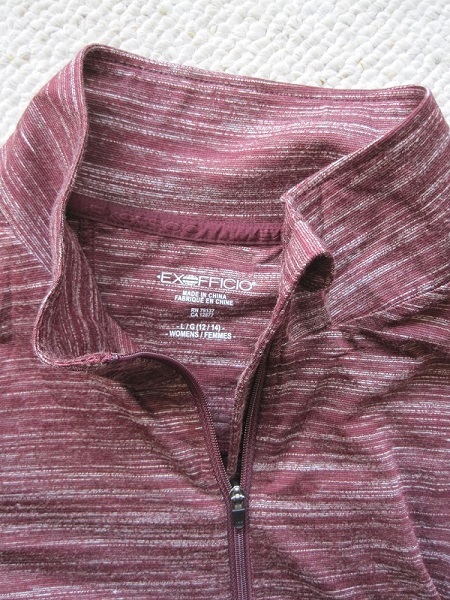 Attached to the shirt with a small safety pin was a cardboard tag that holds the shirt's item description, size, bar code, MSRP $75.00 and also highlights its features. 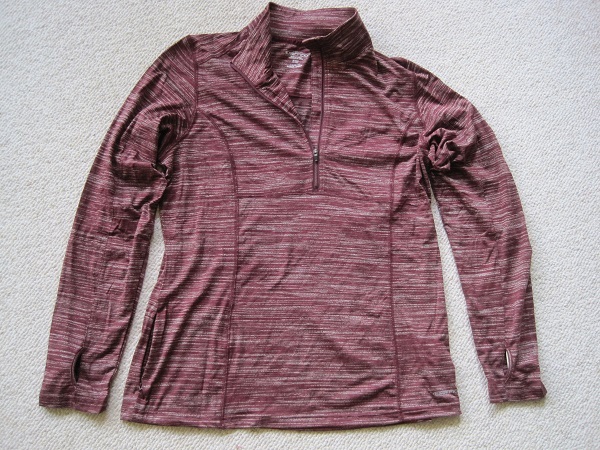 I received the Terma shirt in Brandy Heather (burgundy) in size L.
The ExOfficio Women's Terma 1/4 Zip is a long sleeve shirt with a collar. The shirt is made from a single layer of fabric, while the 2.5 in (6.4 cm) collar is sewn from two layers of the same fabric and due to the double layer, the collar is a bit firm (standing up semi-stiff). The Terma shirt has an 11 in (28 cm) long zipper in the front. At the zipper top, there is a large zipper garage that houses the entire zipper pull and thereby keeps the pull away from my skin. Each sleeve has a 2 in (5 cm) thumb hole. All seams have flatlock stitching in dark burgundy color. Integrated into the right side seam, 2 in (5 cm) above the low hem, the Terma shirt has a hidden pocket with a 4 in (10 cm) opening. 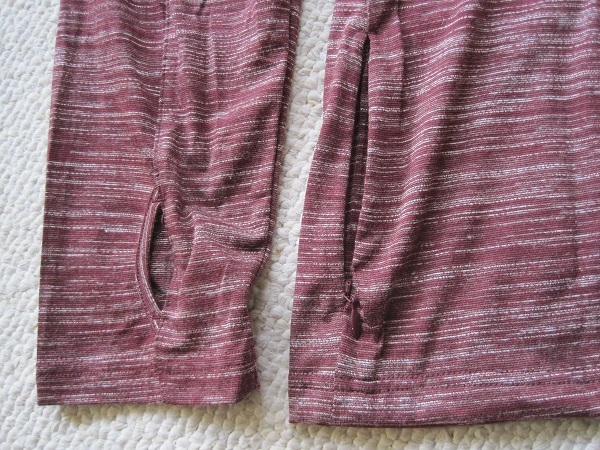 The pocket closes with a zipper with a metal pull. The pocket is about 5 in x 7 in (12.7 x 17.8 cm) and will be large enough for a smartphone. On its lower left side, the shirt carries the word ExOfficio in silver-reflective. The white tag that is sewn into the shirt's left inside seam lists the size as L/G (12-14) 162/102 cm. In English, Chinese, French, German, Spanish, Greek, Italian, Danish, Portuguese, Swedish and Norwegian, that tag explains the fabric contents as 54% acrylic, 27% polyester, 14% rayon and 5% spandex. Per ExOfficio this Terma shirt has their new So Warm technology which shall help keep me up to 5 F (2.78 C) warmer. It absorbs my body's moisture and generates heat, using its textured hollow fibers to provide a superior warmth to weight ratio, the manufacturer explains. The Terma shirt as has ExOfficio's SILVADUR technology which releases silver ions to kill odor-causing organisms on the shirt. The shirt is also described as moisture wicking, quick drying and stretchy. The fabric is super-soft and yes, stretches a bit between my fingers. While I am not a big fan of the Brandy Heather color of the Terma shirt, I am impressed by the softness of the fabric. When I hold the shirt against bright light, the fabric is kind of translucent, so it is not a thick, heavy fabric. I am amazed that this thin fabric shall keep me up to 5 F (2.78 C) warmer. Inspecting the ExOfficio Women's Terma 1/4 Zip Top shirt both inside and out, it is manufactured without flaw in the fabric and all stitching is flawless. I shall machine wash this shirt at the cold setting (86 F = 30 C) with similar colors. Bleach or softeners shall NOT be used. It is ok if I tumble this shirt dry at the low setting if I then right away remove the shirt from the dryer. Actually, I never put this kind of sports wear in the dryer but always let it air-dray, worried that the dryer might remove the UV-protection faster or deteriorate the spandex stretch faster. It is ok to iron this shirt on a low (delicate) setting, yet honestly I never iron my sport shirts. When I put on the ExOfficio Women's Terma 1/4 Top long sleeve shirt, I was surprised by its quite big size. The shirt is overall generous in size, I feel. The sleeves have a wide diameter. The sleeves (28 in = 71 cm from the upper seam to the sleeve end) cover my arms all the way to the finger tips (while on the models on the ExOfficio website the sleeve arm length only goes to the ladies' knuckles). I had selected the size L shirt after looking at the ExOfficio sizing chart and felt supported with my choice when I looked at the well-fitting ExOfficio Women's Sol Cool Long Sleeve Shirt that I own. Now in retrospect I have to realize: the Sol Cool is described as a slim-fit: following the body line to facilitate layering and be ideal for high-energy activities, while the Terma shirt is described as natural-fit: comfortable and flattering and only lightly shaped to the body to allow mobility. So I should have plenty of room for an undershirt and a T-shirt underneath this shirt as outer layer. It took me a while to start wearing the ExOfficio Terma long sleeve shirt, as right from putting it on the first time, the shirt felt oversized and the sleeves too long. I called the manufacturer and a representative explained that the Terma shirt is technically a base layer but also suited as mid-layer. The shirt felt too big for me as base layer and I could only wear it as very loose mid-layer over an undershirt. Finally I decided to keep the L-size and hand-washed the shirt in the sink with a mild detergent, then let it line-dry overnight. I first wore the ExOfficio Terma shirt on the Mt. Pinos snowshoe dayhike as mid-layer over a super-warm long-sleeve undershirt. The Terma shirt has a rather wide, loose collar (maybe because the L-size shirt is a touch too big for me), so I wore a stretchy, lightweight fabric tube as a neck scarf. I wore a breathable insulated winter jacket on top. Due to the heat-generating exercise, I did not wear gloves and did not use the rather long Terma sleeves with their thumb holes. Instead I folded the long Terma sleeve ends up once to stay inside the winter jacket sleeves. I kept the winter jacket two-thirds open almost all day. We had everything from beautiful sunshine to fog and at times heavy snowfall that day. With my clothing layering, I felt comfortable all day. 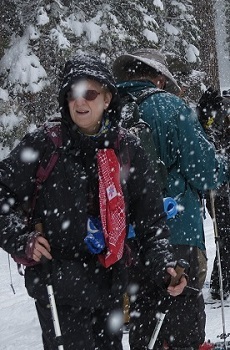 During the Yosemite National Park trip, I was on snowshoes for two days. Day one, I again wore the Terma over an undershirt, plus the insulated winter jacket on top. During lunch, I felt so warm that I took off the winter jacket, while we sat down on insulated sitpads. The Terma shirt was a bit sweaty in the back and the warming sun shining on me dried the shirt quickly. While sitting on the snow, the Terma sleeve fabric at the hands got a bit wet but it dried quickly. Day 2 started with sunshine and blue sky again: I just wore the warm long-sleeve undershirt and the Terma long-sleeve shirt (no insulated winter jacket). That was perfect ... until around lunch it got foggy and even turned to heavy snowfall with strong winds that blew the snow sideways. I pulled the insulated winter jacket out of my backpack to be protected against the wind and heavy snowfall. Neither of those two days I wore any gloves but instead inserted my thumbs into the thumb holes and had my hands covered beyond the knuckles by the long Terma sleeves. For the Pop Top Peak dayhike, I wore the Terma shirt over a long sleeve polyester/spandex shirt and a light, thin undershirt. This was a strenuous dayhike at a strong pace. For a while during steep uphills, I took the Terma shirt off. Once we sat down for lunch, I put the Terma shirt back on for wind protection and kept it on during the entire downhill hike. 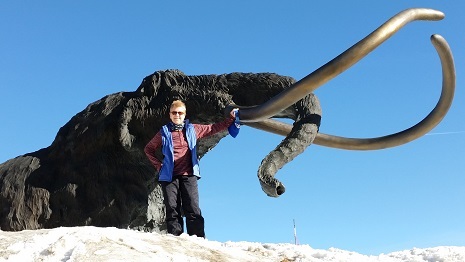 During the two days of snowshoeing in Mammoth, I again wore a light undershirt, the Terma long sleeve shirt and an insulated winter jacket on top when it was cold and windy, or the Terma shirt as outer with the winter jacket in my pack when it was sunny. Not once did I wear winter gloves but instead inserted my thumbs into the sleeve holes of the Terma long sleeves. That was sufficiently warm and protected my hands while using hiking poles. Not once have I used the small pocket, sewn into the right side Terma shirt seam. Probably because I keep forgetting about that side pocket. The pocket is right at the height of my pack's hipbelt, so any contents could pressure-rub against my hip. I never tuck in the Terma shirt. It is pretty long and basically covers my lower back. 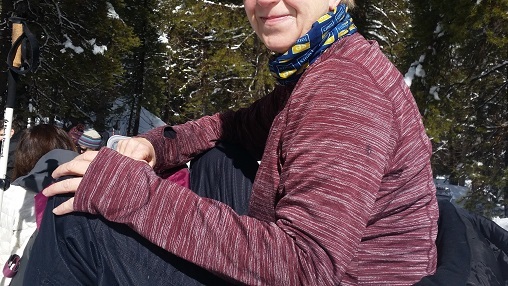 On all the snowshoe outings, I have always kept the zipper closed all the way to the top and worn a tube scarf to protect my neck against the cold. On the Pop Top dayhike with warmer temperatures, I opened the zipper during the warmer high noon hours. I have not noticed any sweaty smells, even after wearing the Terma shirt two days in a row while snowshoeing. Of course, I have always worn an undershirt or a T-shirt underneath and have not worn the Terma right next to my skin. I have machine-washed the Terma shirt after each weekend outing and air dried it (not once put in a dryer). The Terma shirt looks fine: no pilling, no fabric changes. The ExOfficio Terma shirt is a generously sized mid-layer shirt when it is cold and an outer layer during spring / summer temperatures. Terma shirt does not smell after two days of extensive workouts. Shirt shows no signs of fabric wear. Even though it is of thin fabric, it does keep me warm as one of several clothing layers. Collar is rather wide in diameter, so I frequently wear a tube scarf to protect my neck against the cold. Shirt rather large in size; arms wide diameter; sleeves very long. 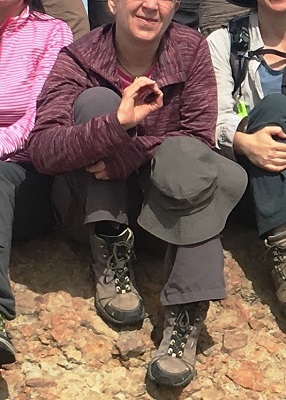 Throughout the last two months, I have worn the ExOfficio Women's Terma Quarter Zip shirt as outer layer (with just a light, thin undershirt below) to protect me against the sun. The long Terma arms cover my hands and help protect my pale skin against sun burn. The oversized fit of the Terma shirt has provided breathability and prevented the shirt from clinging to my body. I have not once tugged the Terma shirt into my pants but always worn it loose hanging. It well covers my back. I have not worn the Terma shirt as sleep wear in my tent. During the Carizzo Car Camp, the temperatures were cool and it was very windy. That weekend, I wore the Terma shirt mostly below a fleece jacket and/or along with other layers, as needed throughout the day. Unfortunately the Terma shirt collar is oversized and therefore does not much protect against the sun, wind or cold, so I typically wear a tube scarf or bandana. While I feel the shirt just hangs loosely on my body without any fit, I have grown to like its features. Even after three days of wearing the shirt during strenuous workouts, it does not develop an odor. Even though I have worn the Terma shirt on many off-trail outings where I had to battle my way through clawing brush, plus during wildlife habitat restoration work, the shirt does not show pulled threads or holes. I have machine-washed the Terma shirt after each outing and air-dried it. Not once have I put it in the dryer. The shirt shows no pilling. I will continue to wear the Terma shirt for my upcoming summer outings with lots of California sunshine. Thank you to ExOfficio and BackpackGearTest.org for the opportunity to test this lightweight shirt.